If you want to live a unique experience, our place is the right choice. Our house is located on the first line of the beach,at the end of a fisher’s town named Manzanillo del Mar in front of the Caribbean Sea; can be heading by car in 15 minutes to historic center. 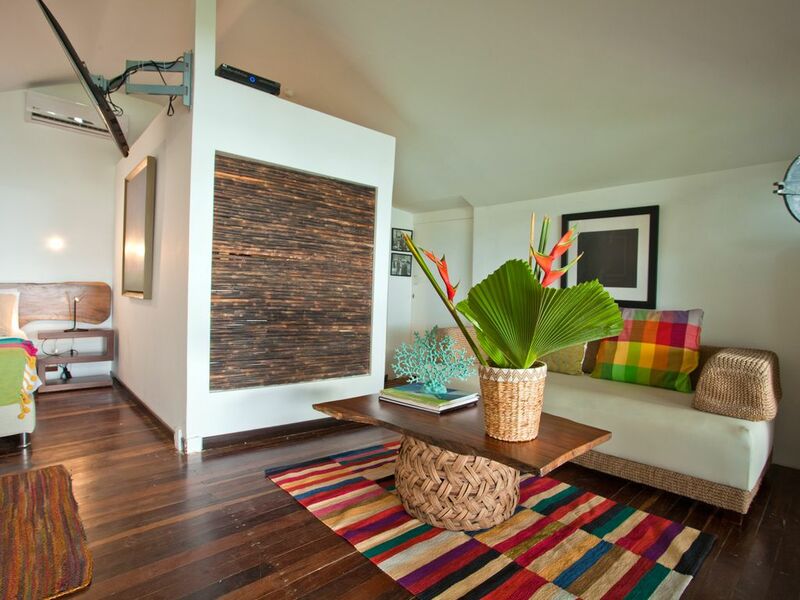 In our place you could have an inside-view of the Colombian Caribbean culture. Sailing with a person of the region in a motorboat,artisanal fishing or having a mangrove tour in a wooden canoe. Kitesurf school near the house. Our house has five private and comfortable rooms, all of them with sea-view and furnished with private toilet; AC, TV (private channels incl. ), safe boxes and small fridges. Two big palm kiosks in front of the house exclusively for guests. To be in front of a quiet beach,see some spectacular sunsets, and in the evenings see many stars. time .Airport Rafael Nuñez to Beach House. sheets and towels if it is necessary. KITCHEN it is available for guests, two fridges,gas stove,microwave, two dishwasher and anything else you can need to prepare meals. In case our guests would like someone to cook for them, there is an available professional chef. Chef can buy the food for his preparation,cook any kind of food, especially the Caribbean traditional dishes and all kind of delicious cocktails. Service include breakfast, lunch, dinner; ceviches and cocktails between meals. Beach house is ideal to be with family and friends. Furthermore, we comply with the sustainability requirements.Solar panels.We are eco friendlier. Rosario Islands, Baru, Cholon; if you wish there is a possibility to rent a boat. •To organize parties or big events without the proprietor consent. •To bonfire on the beach. I am a really good hostess, since the moment the guests book for our house, I am in charge of all doubts or problems could arise before, during or after their stay. I do respect my guests privacy and I am in permanent contact with them. In case of any doubt I am at your disposal. Our house has five private and comfortable rooms, all of them with sea-view and furnished with private toilet; AC, TV (private channels incl. ), safe boxes and small fridges. Two big palm kiosks in front of the house exclusively for guests. To be in front of a quiet beach,see some spectacular sunsets, and in the evenings see many stars. You are on the beach.In our house it is possible to have beautiful sunsets , to see the sea from the rooms or terrace and to fall sleep with the waves sound. If you are looking for a quiet place to take rest, our commodities will make of your stay a pleasant experience. Big balcony in front of the rooms with sea view. Excellent, breathtaking home off the beat and path! I recently stayed with Maria for a birthday trip with 3 others. We absolutely LOVED everything about the place. It looked exactly like the pictures on the site! Her staff was excellent with all our needs and the private chef was phenomenal! I’m a private chef as well so I know great cooking! I would most definitely stay here again when I return to Cartagena. Thanks for everything Maria! !